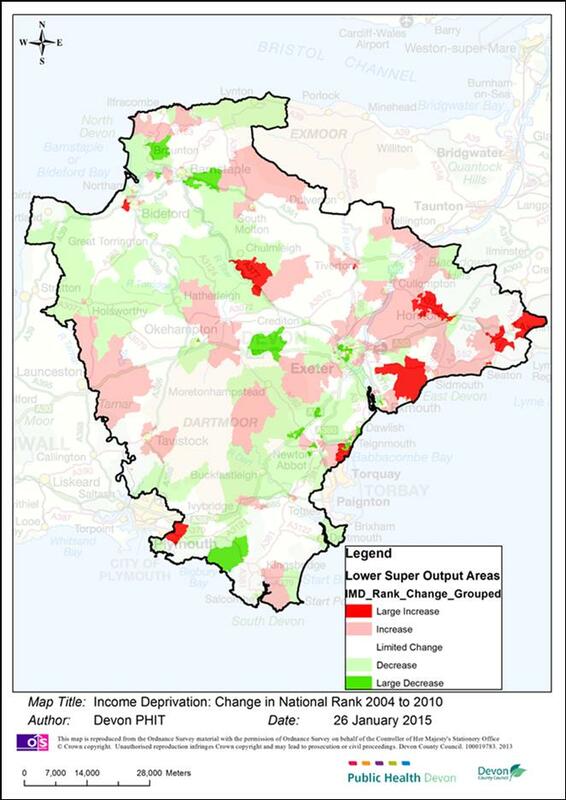 The pattern of deprivation by Devon area is not static and changes over time. The following map shows areas which have since larger relative increases in levels of deprivation as determined by their rank nationally (red shading), and areas with larger relative decreases in deprivation (green shading). 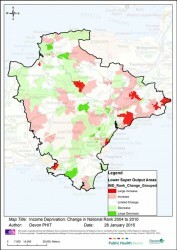 Increases were seen in areas of East Devon, with increases elsewhere in the county seen in predominantly rural areas. Decreases were seen in central parts of Exeter, with the largest decreases outside of Exeter seen in towns in parts of Teignbridge (Newton Abbot, Dawlish, Teignmouth and Chudleigh) as well as in parts of North Devon.